Does your little one love Finding Nemo? Let us rephrase that, is it possible for your family to walk by an aquarium, or anything that has a picture of a clown fish on it, without someone shouting "Nemo!"? If that sounds familiar, then you have a little Finding Nemo fan, and they are really going to make an adorable splash in this Deluxe Finding Nemo Costume for children! The ocean is a huge place, bigger than any other place on the planet. So, finding one tiny fish in the great big ocean may seem about as easy as finding a needle in a haystack (if the haystack were the size of the Moon, plus filled with sharks). But thankfully for Nemo, he is such a friendly little clown fish (plus, cute as a button), so there were plenty of other sea critters willing to help Nemo find his dad, Marlin. We bet it's easy to make friends when you're covered in cheerfully bright orange and white stripes! You already know how much your little one loves Finding Nemo, so they are going to have lots of fun pretending to swim around like a tiny clown fish in this cute costume. The tunic can easily be worn over another costume or their everyday clothes, and features Nemo's friendly face printed on the front. 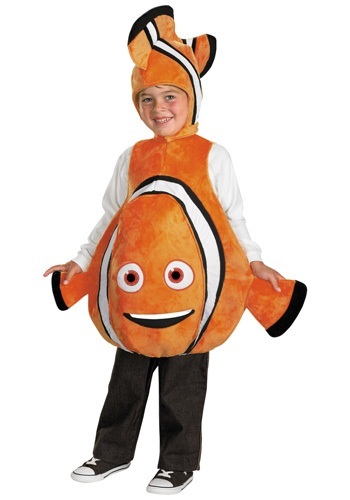 Your whole family can dress up in other adult and child Finding Nemo costumes, so you all can be one big happy school of fish. Now, all of the other kids will be shouting "Nemo!" when they see your little fishy in this costume!